All transactions are safe and secure with a reliable history in online purchasing behind each of our associates. 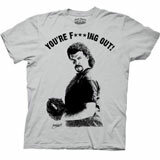 Buy the You're F***ing Out t-shirt to own Eastbound and Down clothing and merchandise. After striking out his opponent during the bottom of the ninth in game seven of the World Series, Kenny Powers yells "You're f***ing out! ", changing the face of baseball as we know it. Endorsements and articles popularize the quote. At games fans chant "You're f***ing out!" asking for more Kenny Powers. Grab one of these Kenny Powers t-shirts today and show him that you are a true fan. In addition to the You're F***ing Out tee above, browse the Eastbound and Down Clothing Gallery for more apparel like men's and women's clothes, kids shirts or hoodies.